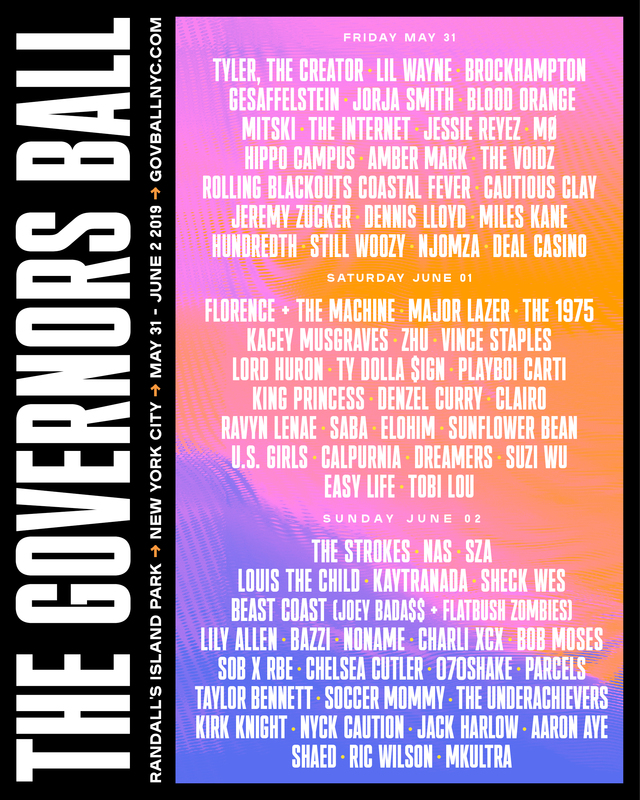 Governors Ball has announced its 2019 lineup, set to feature headlining acts The Strokes, Florence and the Machine, and Tyler, the Creator. The festival, set to take place at Randall’s Island Park in New York City from May 31 to June 2, will showcase huge acts in the industry, along with a handful of notable up-and-coming artists. Friday’s show will include performances from hip-hop’s Tyler, the Creator, Lil Wayne, and the boyband Brockhampton, along with R&B rising favorites Jorja Smith, Jessie Reyez, and Dennis Lloyd. Mitski, indie’s powerhouse star, will also take the stage; her 2018 album Be The Cowboy was known as 2018’s album of the year, according to multiple music outlets. Florence and The Machine is set to take over Saturday’s lineup following the release of High As Hope last year, along with The 1975, touring in support of A brief Inquiry Into Online Relationships. Hip Hop’s Vince Staples, Ty Dolla $ign, Playboi Carti, and Denzel Curry will perform throughout the day, along with pop-country’s upcoming , Kacey Musgraves. Beast Coast, a collaborative effort between Joey Bada$$ and Flatbush Zombies, are due to play on Sunday, as well as Lily Allen, Noname, and Charli SCX. NAS and SZA will also perform alongside acts like Louis The Child, Kauytranada, and Sheck Wes. The Strokes will close-out the festival, marking the band’s first headlining performance in the country since 2016. Aside from over 60 performances across four stages, the festival will also offer NYC food trucks, photo booths, life-size board games, and featured street artists. Check out the full line-up and festival poster below.